It is with disappointment that the YKK Widnes Wild need to inform our fans that this Sundays game against the Deeside Dragons is to be rescheduled as the Dragons would be unable to ice a team due to the unavailability of so many of their players. 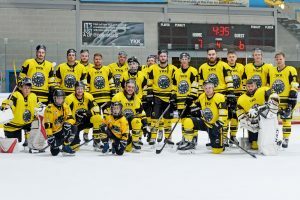 This is despite the fact all teams were told they must be available all weekends throughout the season unless the EIHA were notified at the beginning of the season. Whilst the Wild were within their rights to insist that the Dragons forfeit and for the Wild to be awarded a 5-0 win it was felt that this was not in the best interests of the Wild fans as it would mean that one of the big games of the season would not take place. The Wild were only notified of the situation last week and it was decided to wait until after this weekends games to make an announcement so we could ensure that there was minimum disruption in the lead up to this weekends must win games. Currently no new date has been agreed and as soon as one is agreed we will notify all of our fans.